Think Water Darwin carry a wide range of Diesel Transfer Units from Trans Tank International. TTi DieselCaptain Tanks are rotationally moulded from quality, diesel grade polyethene and have been purpose designed & manufactured to high standards. When properly mounted and operated, provided all precautions and instructions are followed they will provide many years of useful service. TTi DieselCaptain Tanks have a lockable filler cap with strainer and an innovative breather system fitted as standard. All TTi Diesel transfer units come standard with an auto shut-off gun and pumps feature a duty cycle for 40 minutes of continuous dispensing. All pumps also contain an internal bypass that allows the pump to operate for short periods with the dispensing gun closed. 12 Volt 40L/min Dieselflo pump. ¾" auto shut off nozzle. Strong poly lid to protect pump compartment. Locking latch for lid, to protect your investment. 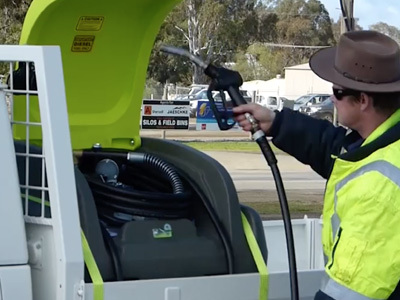 Ergonomic lifting handles for ease of transport 4m x ¾" hose for extra reach ¾" drain bung. Moulded with our unique aluminium ring for incredible strength, this multi-seal system keeps the rain out, and your diesel in 800(L) x 680 (W) x 465(H). Sleek ergonomic design available in three useful sizes, 600L, 800L, and 1000L. 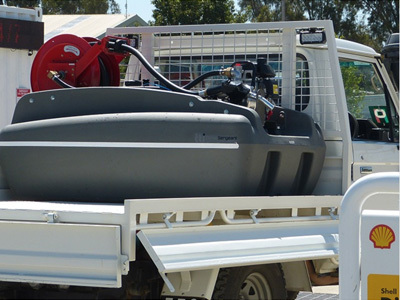 Designed to fit across the width of a standard UTE tray. Provision for tie-down straps to securely fasten tank onto your vehicle. Super strong spring-loaded retractable hose reel with 10m x 25mm hose. Genuine Honda GX50 motor coupled with 210L/min. high-performance diesel transfer pump. Fitted with a ball baffle safety system. 12 Volt 80L/min Italian pump. ¾" auto shut off nozzle. Strong poly lid to protect pump compartment. Locking latch for a lid, to protect your investment. 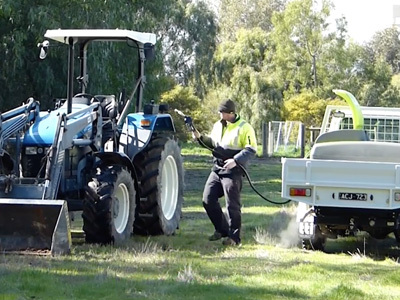 Ergonomic lifting handles for ease of transport 6m x ¾" hose for extra reach. 19mm drain bung. Moulded with our unique aluminium ring for incredible strength, this multi-seal system keeps the rain out, and your diesel in Fitted with Ball Baffle Safety System 1700(L) x 1000 (W) x 1190(H).